And what better way to celebrate than by making an incredibly autumn-esque drink after getting a new tattoo! I’ve been wanting to get a tattoo that represents my marriage for some time now. In fact, I’ve been wanting to get a tattoo that represented our relationship since I finally realized that he was the one. I know that I’ve mentioned before that I wasn’t the nicest teenager, and I feel as if my husband had a lot to do with reigning me in. 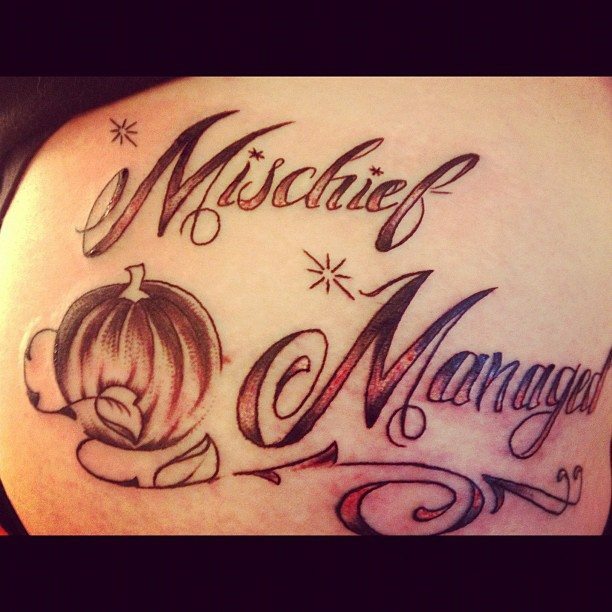 Oh, I also adore Harry Potter, so this tattoo just seemed like the perfect thing to get. On October 29, 2011 my “Mischief” was “Managed” when I married the man who helped reign me in. 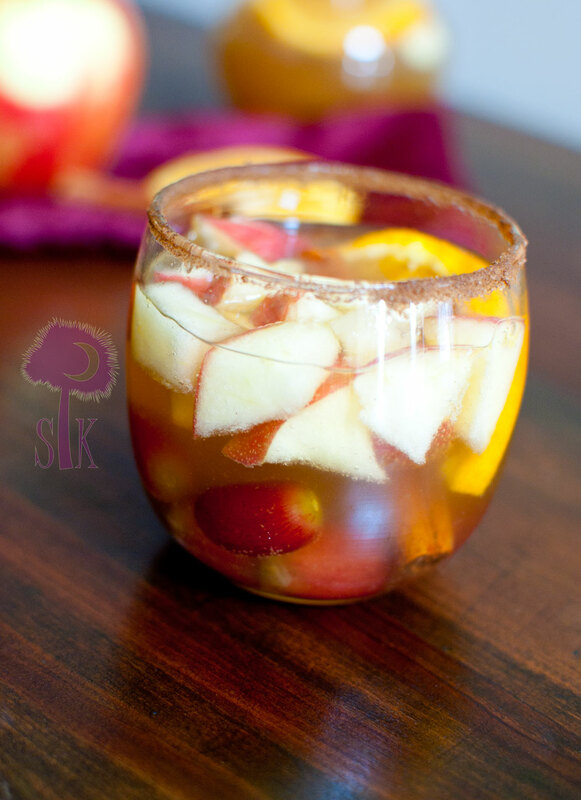 They are deliriously delicious, and I got the original idea when I saw this amazingness known as a Honeycrisp apple sangria on Pinterest. Seriously?!? Nothing short of impressive. Nutmeg Nanny knows what’s up! So, I put my bartending skills to good use and ended up with this. 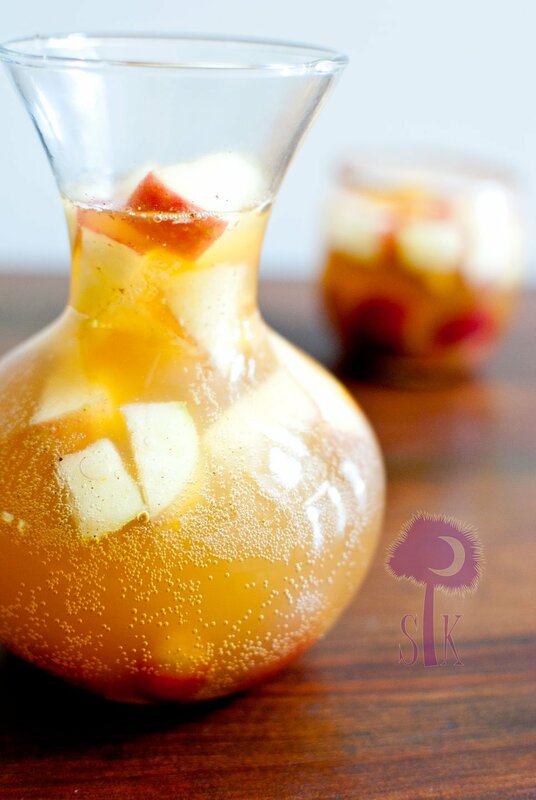 Bubbly, crisp, cold, and refreshing, this cider sangria will literally make you swoon. Like, you’ll immediately catch fall fever after just.one.sip. 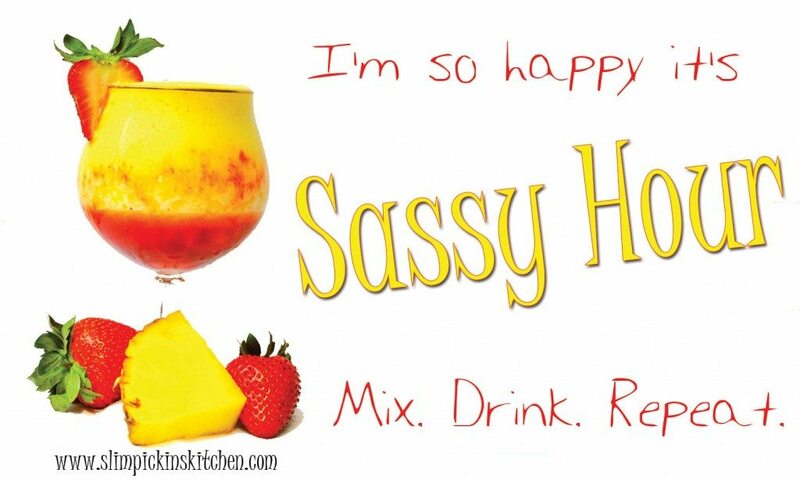 What’s the coolest sangria flavor you’ve tasted? Have you had Angry Orchard cider yet? In a small bowl or glass, pour vodka and stevia (or sweetener of choice) over apples and grapes, stir, and let steep for as long as you'd like. The longer, the better, but no more than 24 hrs. 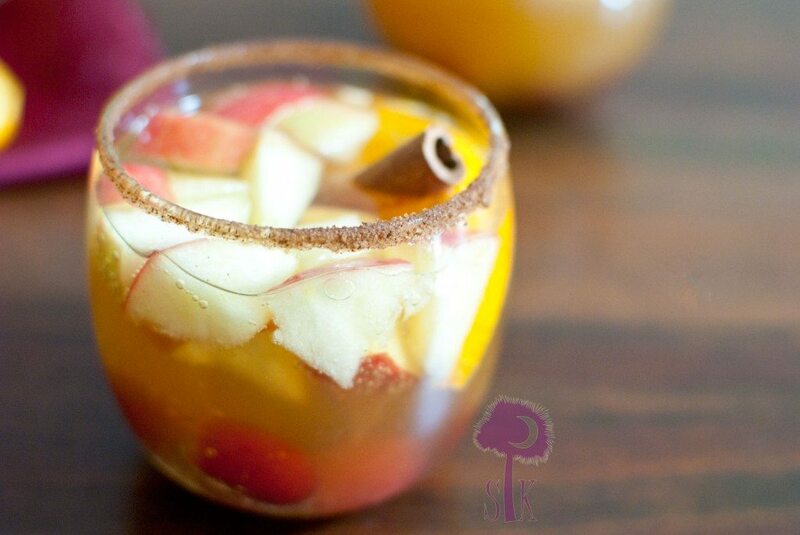 Spoon steeped fruit into two glasses rimmed with cinnamon sugar. Pour 1/8 cup of apple cider in each glass then top with the Angry Orchard hard cider. Stir with a cinnamon stick, add orange slices, and serve. Hi! Thanks for your question 🙂 If you are looking to add less alcohol, I’d suggest using a non-alcoholic sparkling white grape juice or a sparkling apple cider if you can find that. If you are looking to keep the same amount of booze in it, I’d go with a Sparkling Moscato (sweet white wine) or a spumante sparkling wine/champagne. Either one of those should be available in the wine section of a standard grocery store. Oh, and I’d also add a a splash or two more of the non-alcoholic cider as well just to keep that appley flavor! Let me know how it works out! Oh! I forgot to mention (and I thought about this while I was falling asleep last night) if you can’t find any Angry Orchard hard cider, ANY hard cider brand would do i.e. Woodchuck, Strongbow, Crispin. I just wanted to make that clear! Made some today and I will make more for my brothers birthday . Hi! This looks great! I am looking to make it for a party. Do you think I can put all the ingredients together in a punch bowl or do you need to add the ciders seperately? Had a rough day? 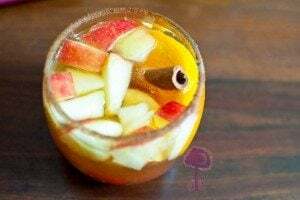 Relax with these 5 tasty sangria recipes that you never knew existed - Czaal is a source for deep thinkers, lifelong learners and truth seekers. Posts on science, self-improvement, psychology, unexplained mysteries.